They say that this part of Devon boasts its own microclimate. The rest of the UK can be bathed in sunshine but here, up on the wilds of Dartmoor, rain can be thrashing down from the skies, often sideways and usually bitterly cold. 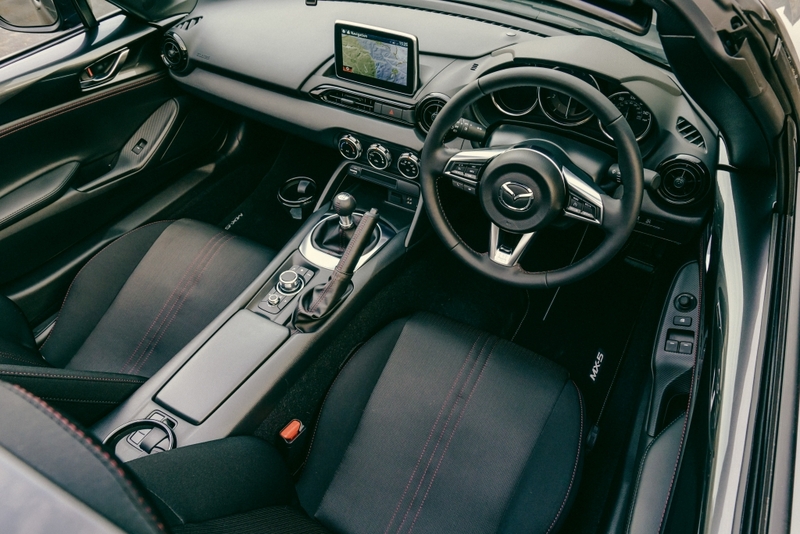 It’s arguably not the best place to test Mazda’s handsome retractable hardtop roadster – the new MX-5 RF – and by the third opening and closing of the new-fangled roof, we’re beginning to question our sanity. But, as always, Devon surprises; the clouds part and a low wintry sun emerges. We drop the tin-top once more, wait 13 seconds for it to do its business, slot the snappy gearbox into first and head for the twistiest part of the National Park. 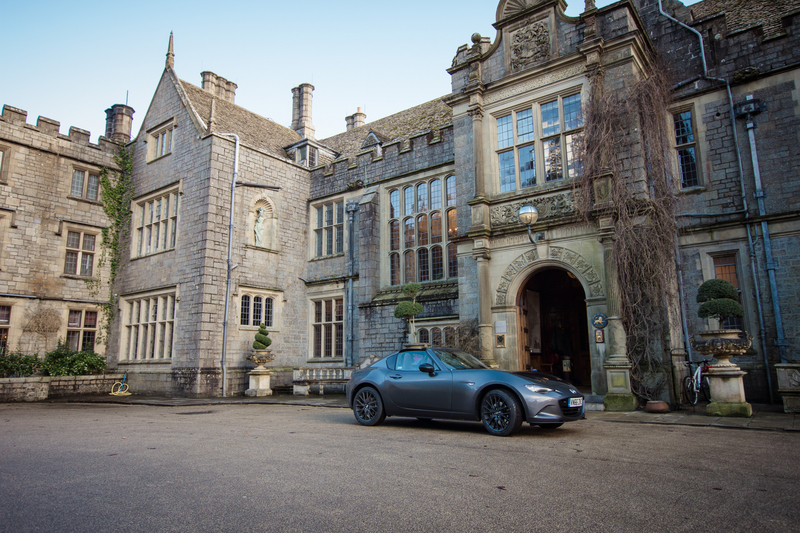 Rewinding slightly, our latest road trip actually starts in Exeter, where Mazda’s latest iteration of its venerable sports car awaits us. Dubbed the RF (short for “Retractable Fastback”), it is undoubtedly the car many MX fans have been waiting four generations for. Styled like a mini Porsche 911 Targa, rather than a cut-price convertible, the MX-5 RF is by far the best looking version yet, its folding hardtop ensuring drivers that they can enjoy the car in all weather conditions (and they can do so looking the bee’s bananas). 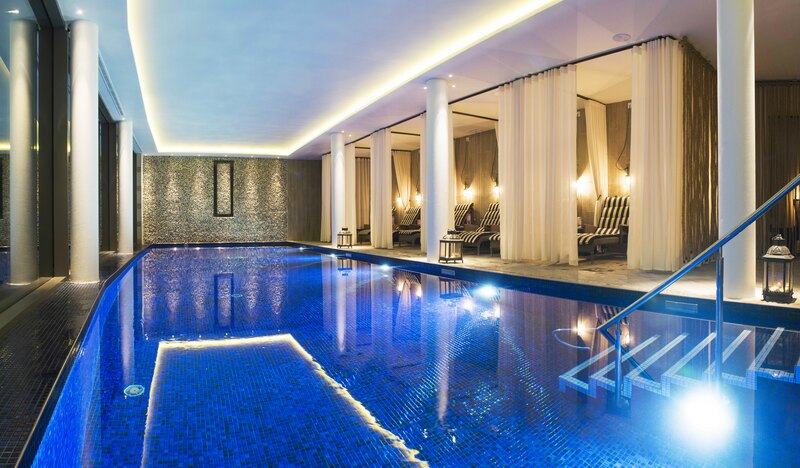 Set in 275 acres of green countryside, this luxury country house boasts a first class spa, golf course and a selection of restaurants and eateries that cater to everything from gastro pub-style grub to exquisite fine dining. 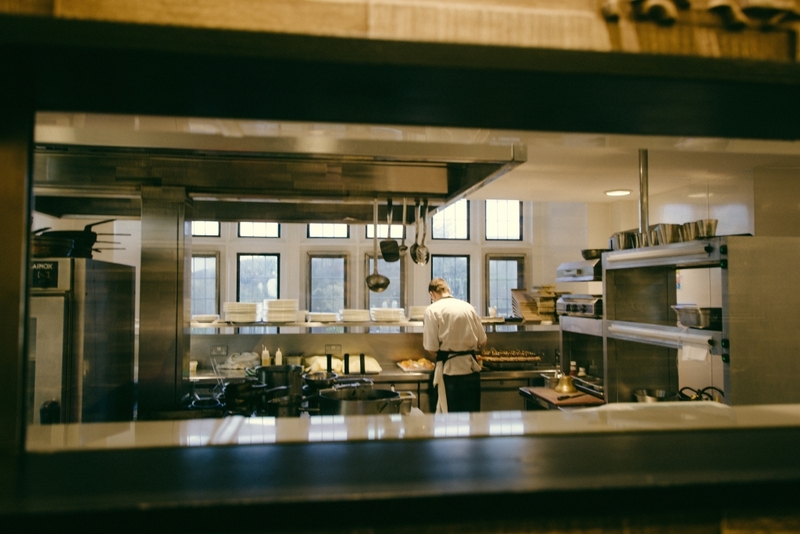 An entire afternoon can happily be spent in Smith’s Brasserie, with its roaring open fire pit and near-360 degree views on the surrounding countryside. From the flying buttresses that rise from the rear haunches, to the steeply raked windscreen, everything about the new RF and its ‘Kodo’ design is purposeful. Specify it in the ace Launch Edition trim (limited to just 500 models in the UK), like our test car, and it receives bespoke 17-inch BBS alloy wheels, a contrast roof, deep metallic ‘Takuminuri’ paint and a piano black boot-lip spoiler. There’s no doubt, it looks fantastic. We throw our camera equipment and small overnight bags into the equally minuscule boot and clamber into the low-slung sports seats. 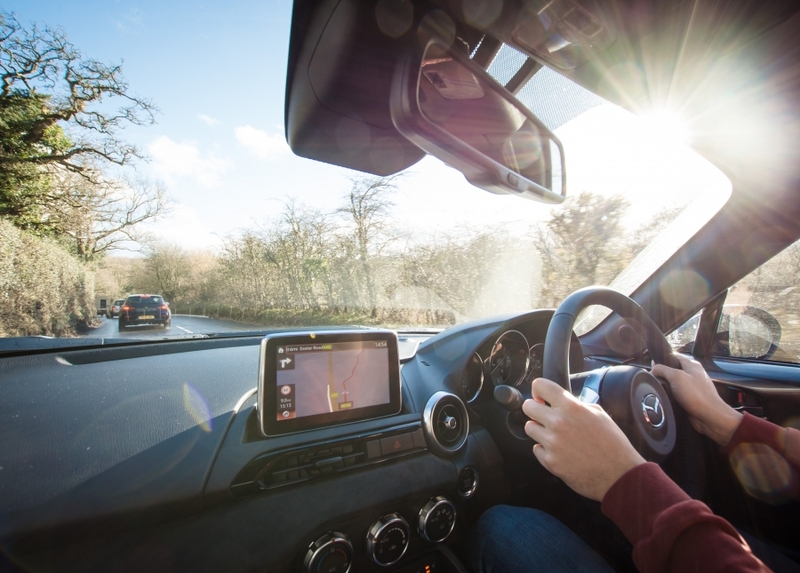 The MX-5 has always been snug but with two adults and some kit it feels claustrophobic. It’s no bad thing, encouraging the driver to press the button that operates the electrically folding roof and treat the passengers to some much-needed breathing space. Although we’ll have to wait for oxygen, as the first part of the journey involves a brief hack along the A38 towards Dartmoor, which gives us a good opportunity to assess the refinement with the roof up. 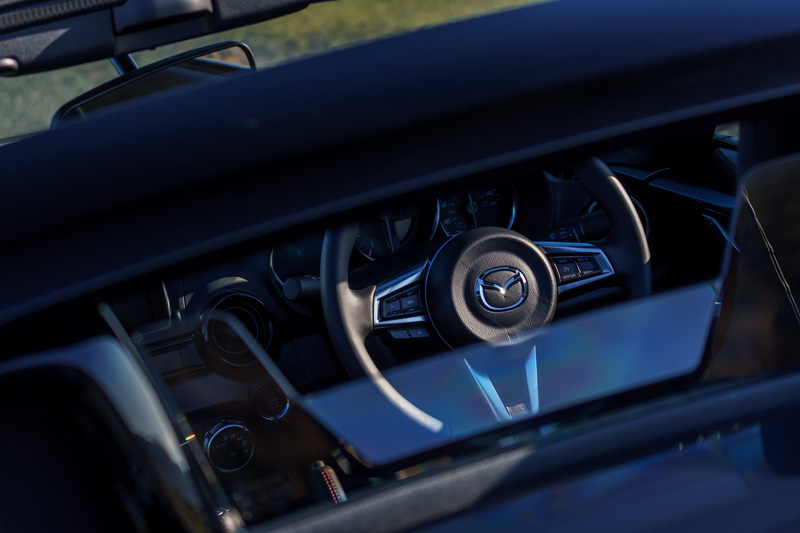 According to Mazda, engineers added insulating bulk to the rear wheel arches and around the transmission tunnel of this RF, as they thought the quietness afforded by the multi-layered roof would highlight noises from elsewhere. 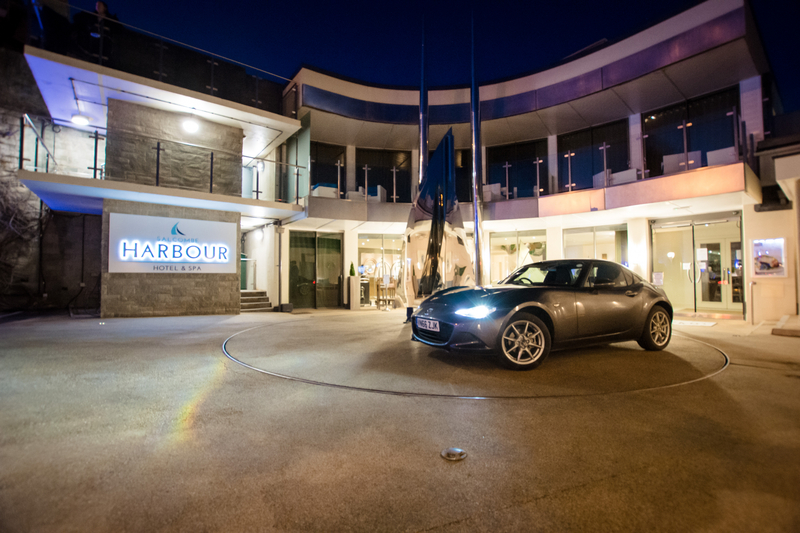 They shouldn’t have worried because, despite their best efforts, the MX-5 RF still suffers from a fair bit of wind and road noise. In fact, at motorway speeds, it gets rather rowdy. Drop the top and things get even worse, as those muscular haunches that give the RF its distinct look also turn out to be a major cause of buffeting. If you’re thinking of doing any long motorway trips this summer, pack some earplugs. Thankfully, this top spec model, which seems a bargain at £25,695, also comes with a premium Bose sound system, which does its best to drown out the din creeping into the cabin. We soon peel off the busy dual carriageway and begin to traverse the tiny lanes that cover most of Dartmoor. 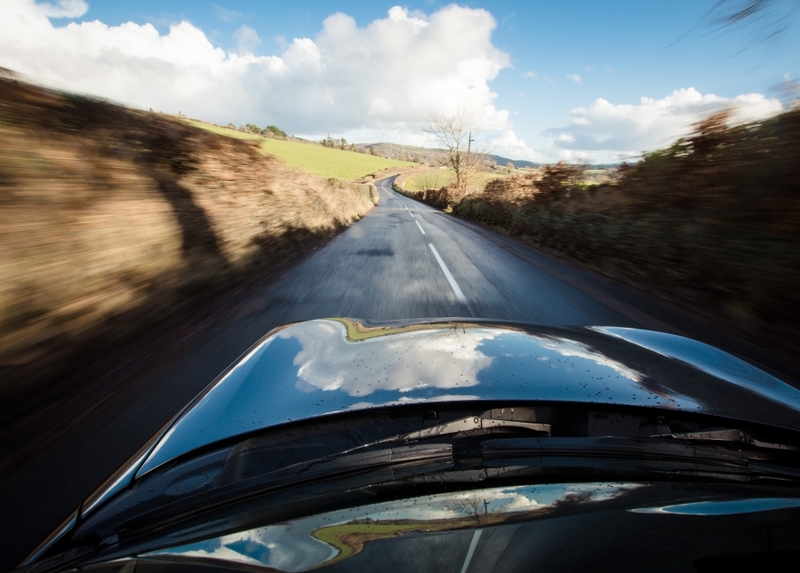 Renowned in the area, these ‘roads’ are often choked into a single lane, forcing us to slam on the brakes and skid across the muddy surface at the mere whiff of an oncoming vehicle. It’s enlivening, if not completely enjoyable, but this larger 2.0-litre engine is doing a great job of masking poor gear choice. There’s enough torque in the powerplant to cope with the additional 45kg of metal roof, which can’t be said for the lower-powered 1.5-litre, 131hp version. 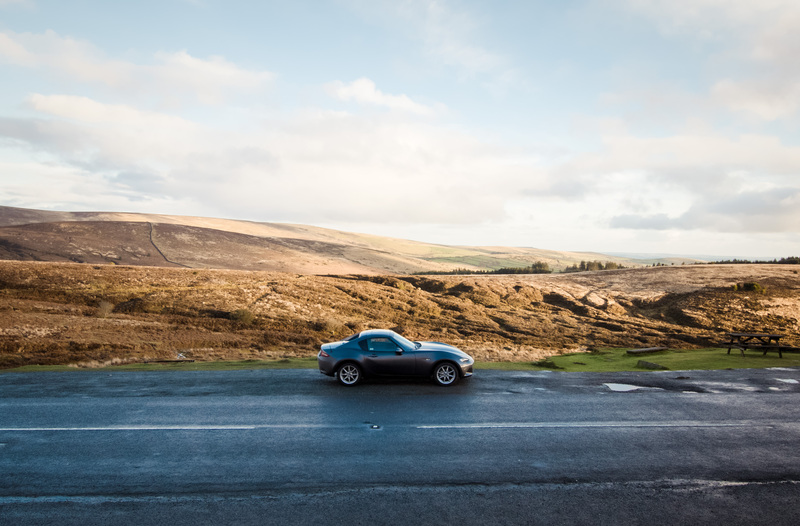 After a quick stop off at Bovey Castle for refreshments and photos, we head to the centre of Dartmoor on the promise of empty roads and beautiful dusky skies. Devon doesn’t fail to disappoint and despite the 40mph speed limit enforced throughout the National Park, it’s still possible to have plenty of fun in the RF. See, that’s always been the beauty of an MX-5. You don’t need silly horsepower or neck-snapping acceleration to get your kicks. The car feels so alive, and even through slower corners it’s possible to get a feel for its dynamic limits without endangering life. It’s no wonder half a million models have been snapped up in the UK alone since it was first launched in 1990. The modern RF is no different to its predecessors, and despite the additional weight, this 2.0-litre version feels just as fun on rutted UK roads. The gearbox has a beautiful amount of weight and the steering gives plenty of feel and feedback. 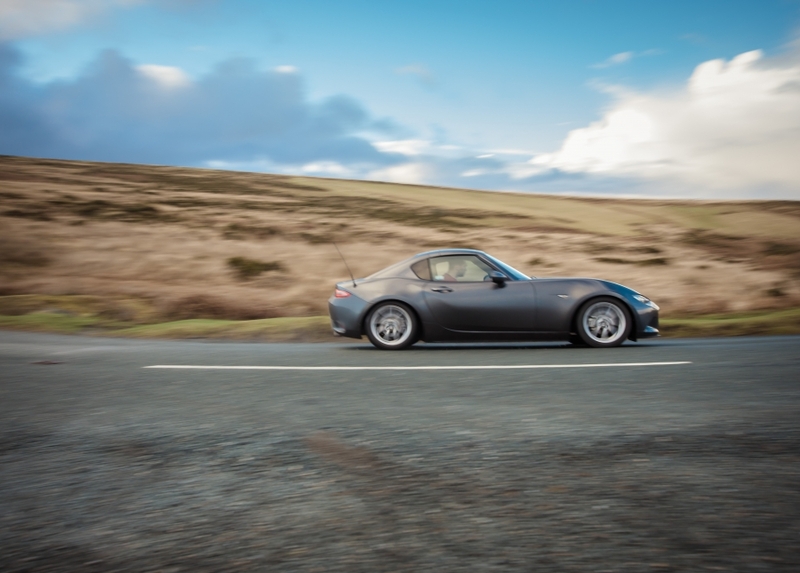 Head for a tight left-hander, drop a gear, turn in and the MX-5 RF responds immediately. Pile on the revs and it will understeer but adab the brakes and the rear twitches slightly before settling down and catapulting out of the corner. It’s fun, often adrenaline-inducing but rarely with a sense of impending doom. As an introduction to the world of sports cars, this is faultless. The sun and the mercury begin to drop (thank God for heated seats), so we punch our overnight accommodation into the surprisingly capable MZD-Connect infotainment system. The Salcombe Harbour Hotel sits proudly on the estuary of the same name and is around 40-miles south of our current position. It’s dark, the roads are narrow and we’ve been on the road all day. We decide to raise the roof once more and take the quicker motorway route to our lodgings. A wise choice. The rain-sensing wipers kick into action a mere 30 seconds after we fire up the engine. A recent multi-million pound refurbishment has seen the addition of a luxury spa, private cinema, waterside restaurant with wide outdoor terraces and chic rooms with panoramic vistas of the estuary. The hotel’s Jetty restaurant features menus created by award-winning Chef Patron, Alex Aitken and top local chefs who strive to deliver fresh and seasonal dishes. Better still, the Crustacean Bar attracts diners from far and wide with the day’s fresh catch, cooked in whatever way pleases. The Road Trip Gods are once again smiling down on the MX-5 RF and we are treated to a glorious morning on the Salcombe Estuary. With breakfast ingested and any remnants of last night’s session ales now a distant memory, we grab the keys and endeavour to complete our loop back to Exeter. The day’s route takes in the stunning A379 coastal road, which slices from Torcross to Strete, navigating the Slapton Ley National Nature Reserve before climbing to reveal staggering views out across the English Channel. 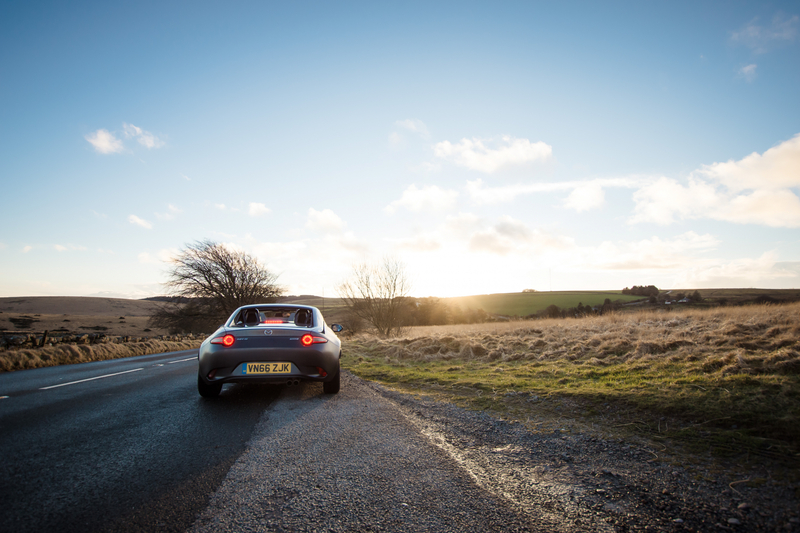 Blazing winter sunshine means the roof of the RF can remain retracted and it gives us a chance to ponder the exhaust note – a slightly irritating drone rather than a sporty rasp. 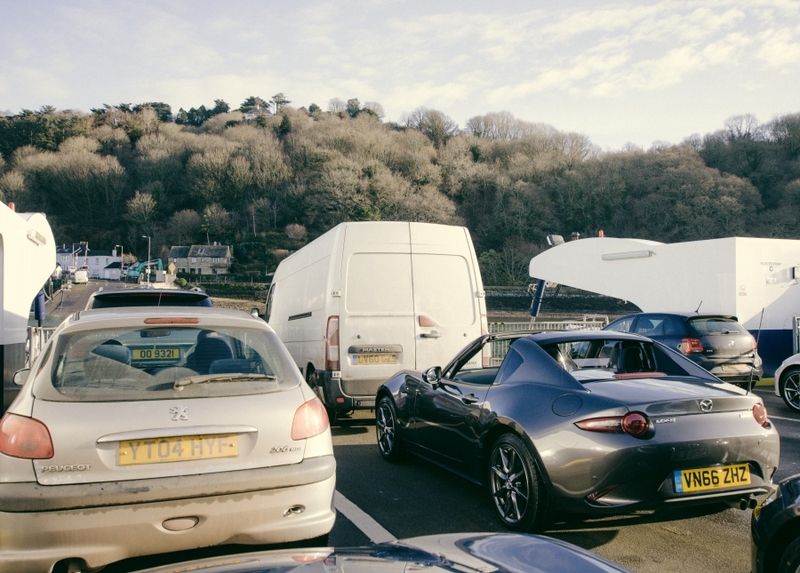 Just before entering Dartmouth, the sat nav system demands we use the Kingswear car ferry to cross the River Dart. It’s a welcome respite on such a fine day and gives us chance to stretch our legs before the motorway hack from Paignton to Exeter. Parked up on the ferry, in amongst the Transit vans and VW Golfs, the Machine Grey MX-5 RF draws a few admiring glances. Admittedly, it’s not the sort of attention you’d get in a Porsche or Ferrari but that has always been part of the appeal. We haven’t ventured to the world’s most exotic location, nor have we driven on the world’ most enthralling roads, but it has been a memorable trip nonetheless. 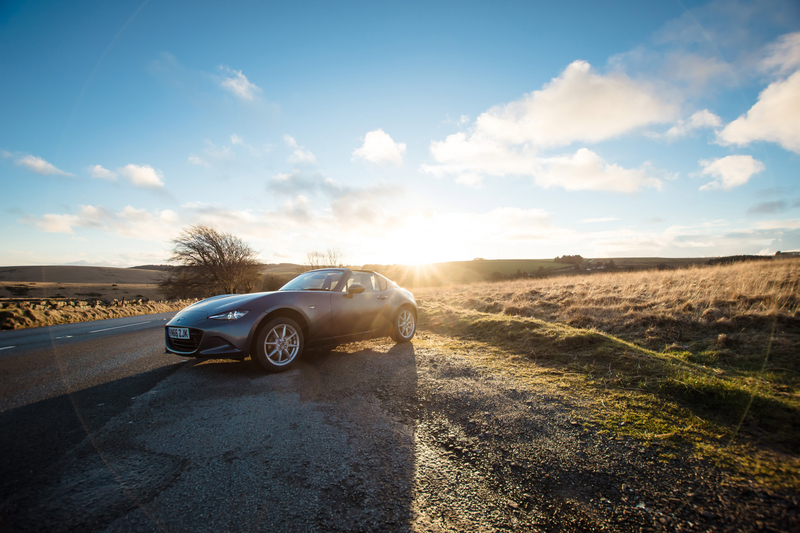 That’s the effect of an MX-5: some of the most entertaining drives can be burnt into the memories of even the most ardent petrolheads. All via a £22,000 Japanese roadster with a 160hp engine.